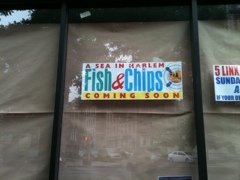 We were walking along St. Nicholas Avenue the other day and saw these signs that said ” A Sea in Harlem, Fish and Chips, Coming Soon,” posted on the southwest corner building located of West 113th Street and St. Nicholas. There were no other details posted on the windows. Does anyone know what’s up with this particular area? If so, do tell! Check out our review, then the venue. Let them know HarlemCondoLife sent you! 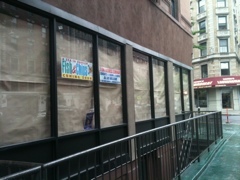 Anyone know what is up with Pink Teacup on Lenox? I am sure there will be a variety of culinary style to suit everyone’s taste! I can’t wait! We’ll be sure to try it out as soon as it opens! I’m the owner and soon means soon ! There are more things behind the scene than people realize that has to happen before you can open a place this size,so take it from the horses mouth. The signs have been up for a month or more. So “soon” appears to be a flexible concept.